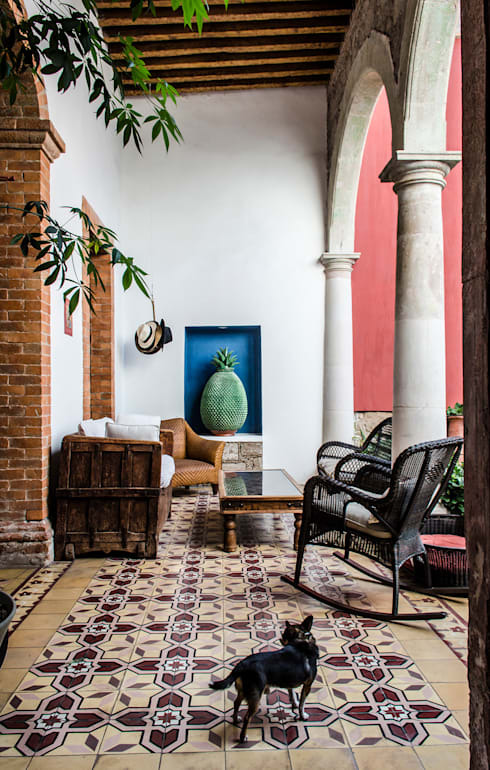 Today, we are going to travel all the way to Mexico where design professionals Oscar Hernandez have photographed the most incredible house, which will teach us all a thing or two today! This charming and historical home shows just how beautiful rustic can be as well as why it is so valuable to maintain the heritage and history of buildings, structures and designs. Not every home is meant to be modern, cutting-edge and savvy. In fact, there are a lot of advantages of preserving the original. This unique home will warm the cockles of your heart today as we explore it from the outside in. You will love the integration of nature throughout as well as the beautiful, antique elements. The outside of the home is like no home we have ever seen before. 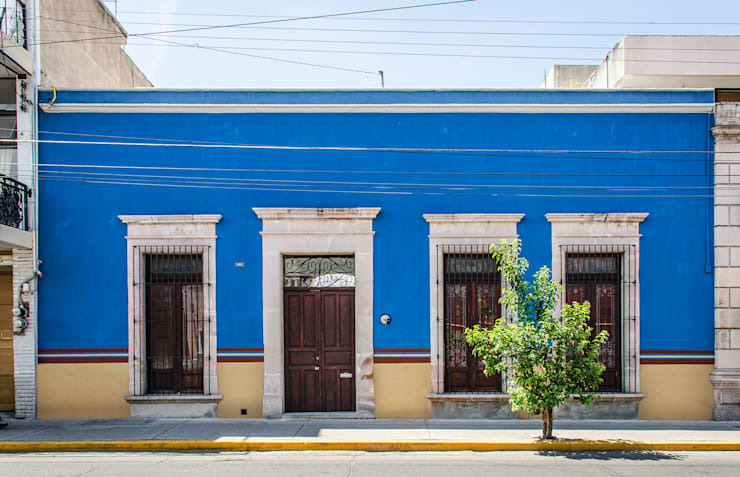 With a bright blue facade and gorgeous wooden doors and windows, this home is appealing in its age. Immediately we can see that the design comes from a different era. Yet the historical shape and style of the building is very enchanting while the blue and cream facade makes for an aesthetically appealing look and feel. The details and design of the burglar bars as well as the old, stone window and door frames add to the charm. Wouldn't you be curious to look inside? This home is characterised by a beautiful connection between the interior and exterior spaces. 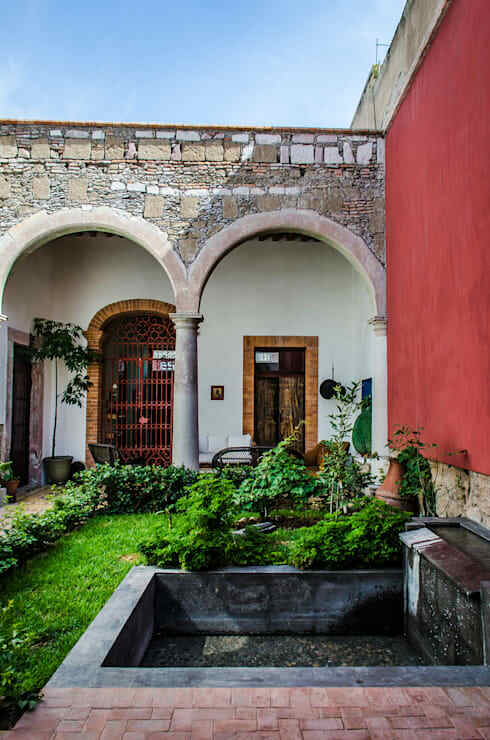 Here we come across a spacious courtyard with a garden and water feature. This allows guests to travel through sunshine and fresh air as they make their way to the front door. The beautiful stone facade brings in a very earthy and authentic charm to the design, while the large arches remind us of another time. Remember that no matter what style your home is, the garden plays a big role when it comes to the look and feel of the design. Have a look at how you can make a big first impression with a small front garden for inspiration. 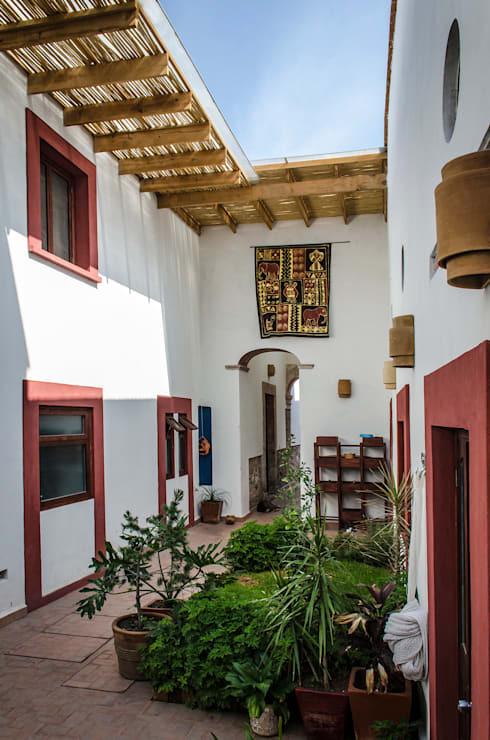 In this open courtyard, we can see how these spaces allow for fresh air and sunshine to flow into the design of the home. Very careful attention to detail has been paid throughout. Don't you love the detailed quilt that hangs like a tapestry on the wall? Plants and flowers play a big role throughout the design of this home, connecting it flawlessly to nature. Neutral colours enhance the fresh and vibrant colours. This is a very tranquil and serene home. 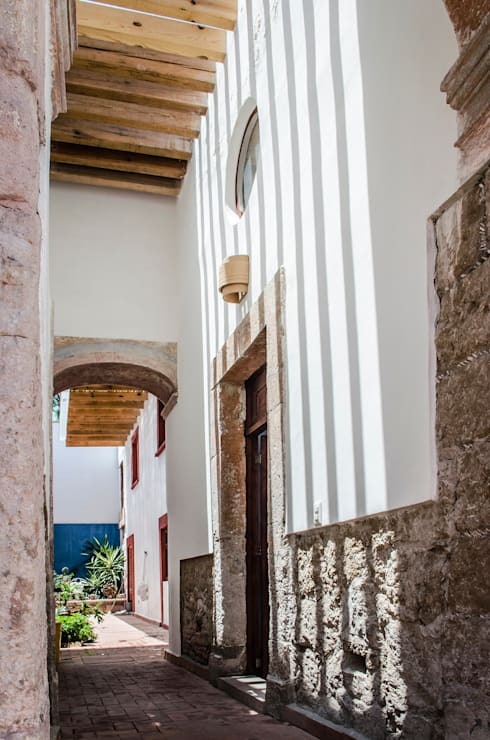 Even the hallways and connecting spaces are light and bright, with raw and earthy materials such as stone and wood playing a role. This creates a rustic design, which enhances the original structure of the home. Don't be afraid to mix materials including stone, wood and even glass when it comes to the design of the house. As you can see in the image, they all complement each other beautifully. Have a look at how to make your home roar with raw materials. The little terrace of this home is a very comfortable and eclectic spot with more than enough comfortable chairs for the whole family! A patterned tiled floor contrasts with different colours throughout, while the range of wooden furniture brings a very homely and warm design to the space. The rocking chairs are the cherry on top! 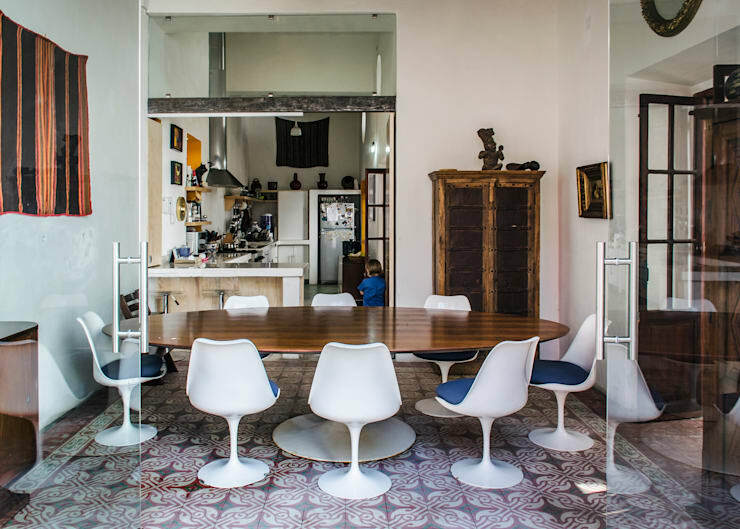 The dining room of this home opens up onto the courtyard thanks to large glass doors. This extends the living space into the beautiful outdoor areas, which we have already explored. This is a great way to make more space as well as make the most of the exterior design. As you can see in this image, the decor and design of the interiors are subtle, homely and understated. 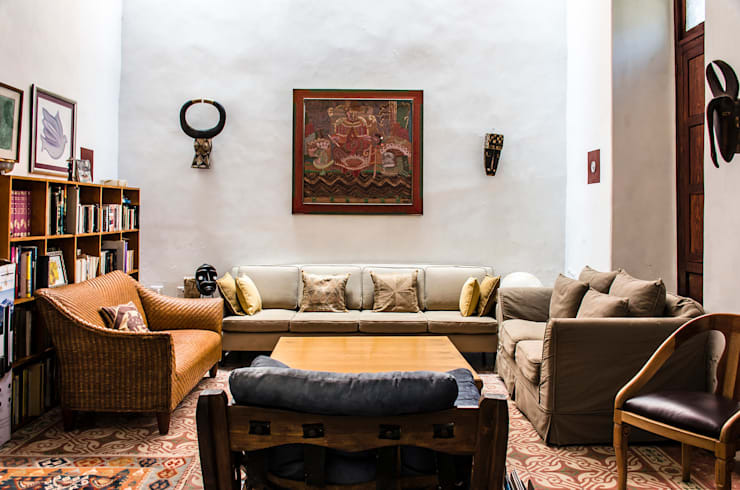 This is truly a family home, with decor items and elements that represent personalities and interests. 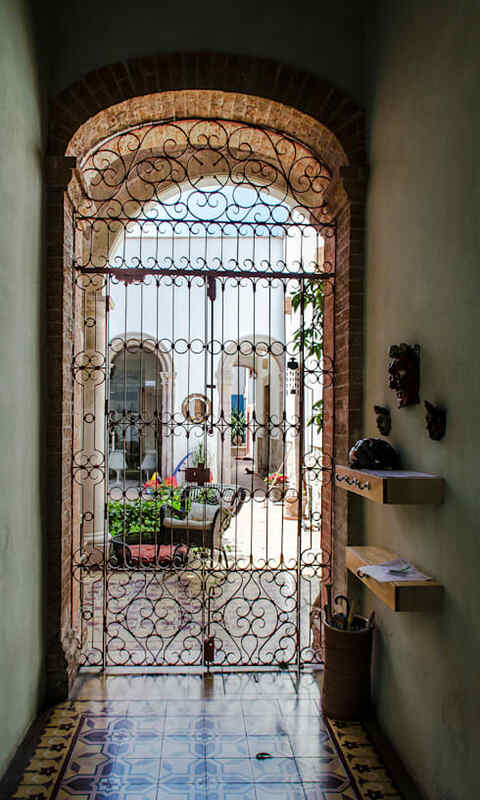 A beautifully detailed wrought-iron gate opens up on the entrance of this home, making quite a first impression. The entrance hall features shelves, where keys and other small items can be placed. There is also a basket for umbrellas. This is a wonderful example of a warm, welcoming and functional entrance that is sure to pack quite a punch. This more formal living room is very neat and stylish, while still featuring elements characteristic of this eclectic home. The decor items and artwork have all been carefully chosen to keep the historical and charming look and feel in tact. The rest of the furniture is neutral, with earthy tones enveloping guests and family members alike in warmth and harmony. Tip: Add shelves to a room like this where books and decor accessories can be stored neatly away, while still on display. The television room is slightly more casual than the rest of the home, but with a very impressive feature—natural light flowing in through the ceiling beams! 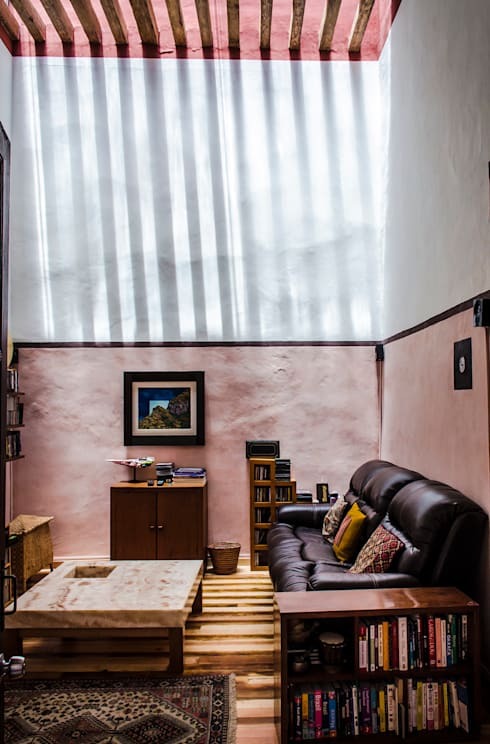 This is a great example of how natural light can truly enhance the look and feel of an interior space, especially if the room is small. This is a modern concept, but this shows that it's worked for many years. The bedrooms in this space truly represent the people who dwell in them! The designers have had some fun and creativity with the kid's bedroom, playing with shapes, colours and styles. 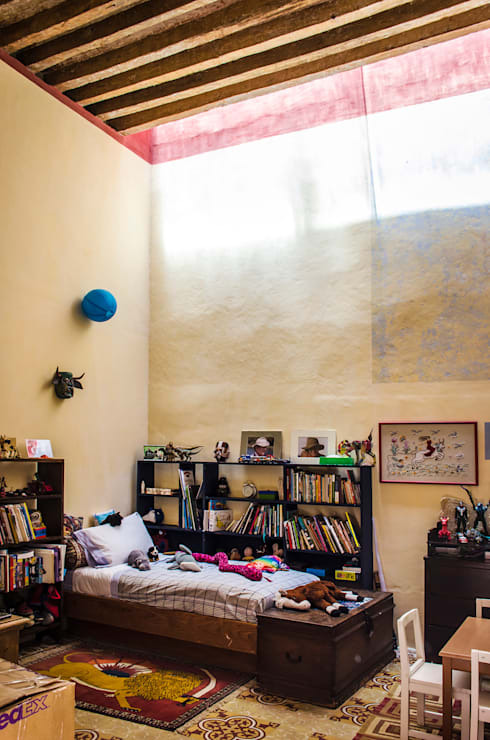 The result is a room that any kid would feel free to let their imaginations run wild! Again, we can see how important shelves can be for a room design. The main bedroom is slightly more simple than the rooms we've seen throughout the rest of the home. This is a space that is meant to be tranquil and serene, which is exactly what the designers have achieved by going for a predominantly white design. Yet, a touch of artwork here and there still keeps this room in line with the rest of home's style. 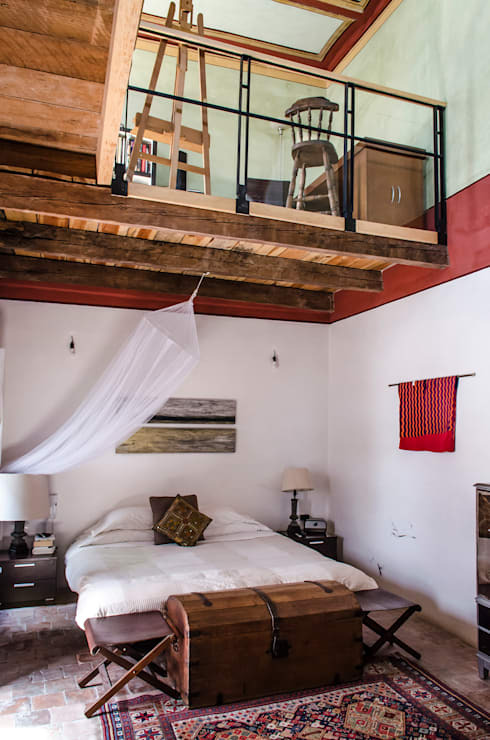 Don't you love the little loft, which has been installed above the bedroom? This is a perfect way to utilise vertical space, creating an extra room for studies or work! We end off our tour in the bathroom, because it is just so unique and special. 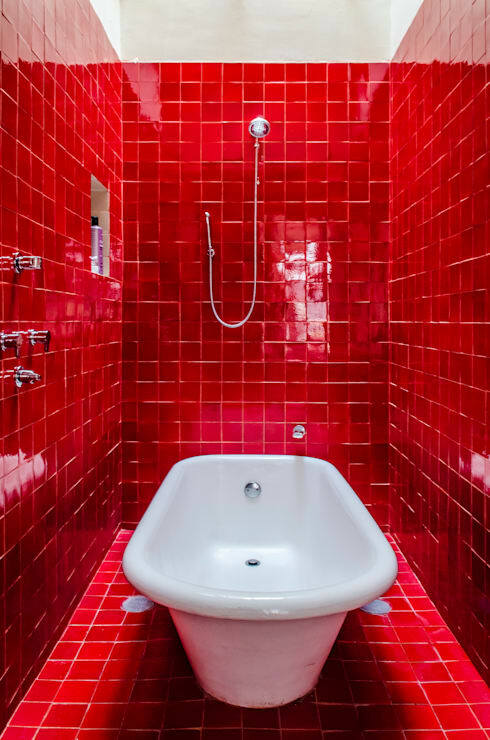 The designers have gone for all-red tiles, creating a very dramatic look and feel! The red tones contrast beautifully with the white bathroom features. This is a bathroom you wouldn't forget in a hurry! What do you think of this unique home? Comment your thoughts below!